It’s usually one day in November. It turns on, just like that. We’ve got another few degrees to go but folks are already starting to get excited for the fall striped bass run. The striped bass (Marone saxatilis) is a migratory perciforme fish found from Maine to the Gulf of Mexico, traveling the open ocean and spawning up inland waterways, our bay being ideal for reproduction. When the bite is on, you’ll see hundreds of boats, from the head boats to charters, big sport fishing operations and three guys huddled together in a dingy with hopes of having a slammer day. And we’re right there, fired up about chasing them this fall. Anyone who has ever had a nice striper fillet knows how delicious it is. But you won’t find striped bass on our menu or in our fish case. You won’t find them in any restaurant or market in New Jersey. Our state does not allow the commercial fishing or sale of striped bass and we fully support that restriction because of the importance of this species to our area. Each coastal state is allocated a certain harvest quota by the Striped Bass Interstate Fisheries Management Plan, which falls under the Atlantic States Marine Fisheries Commission. 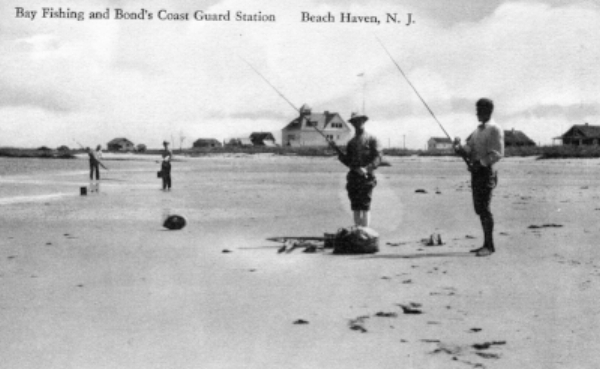 In 1990, New Jersey made the decision to make that entire quota for recreational fishermen. Protecting the species in our state waters means keeping the stocks up so that anglers can go out and enjoy striped bass fishing, passing on the tradition to the next generation – the whole experience of finding the fish, hooking up, landing, cleaning, cooking and eating it for a family dinner. Dave Werner, fisherman, biology teacher and regular customer and his daughter, Amalie. Photo courtesy of Werner. “That shifted catch limits to recreational fisherman to enjoy catching this sought after species,” adds Werner. The keeper size for a striper is 28 inches and anglers are allowed to keep one per day unless the second fish is longer than 43 inches. . The bass season in marine waters is from March 1 to Dec 31. And yes, we’ve had some epic bites the last week of December. According to the fisheries commission recreational anglers harvested an estimated 18.2 million pounds of striped bass in 2015, which it attributes to the regulations. Maryland landed the largest percent in numbers of fish at 30%, followed by New Jersey at 21%. It is estimated that fishermen release about 80 percent of the bass they catch. Protecting the species is also very important to our local economy because of the dollars it brings in through recreational angling. People buying boats, renting slips, gassing up, staying in town and buying bait and tackle are a huge industry here. We’re also very happy to have those folks coming into Mud City, the Black Whale and the Old Causeway in November and December. Little Danny Vilardi knows where to find ‘em. Striped bass eat just about anything in the water from flounder to crabs, mussels, squid and even flounder. They’re usually caught locally when they’re following baitfish like bunker or sand eels. 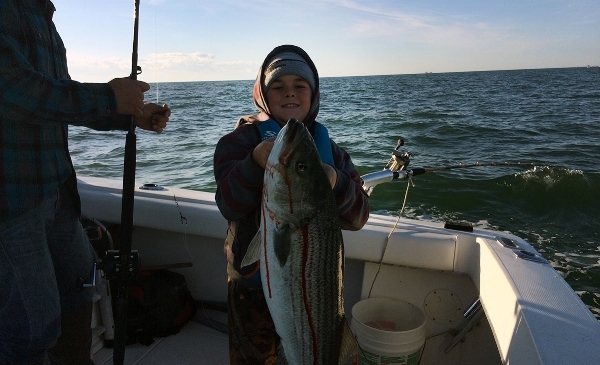 We fish for striped bass from boats, from the beach, and even spearfishing along jetties. Striped bass fishing is about gaining experience and knowledge. Part of the allure is that there are so many different ways to fish for them from snagging bunker to live eels, fly fishing, metal, top water poppers and trolling, or sometimes just throwing chunks of clam into the surf. The fall striper run is something we really look forward to here around LBI. There seems to be plenty of bait around. Let’s keep our fingers crossed for a banner season.